The Way of The Beauty Way: Can You Look Them In The Eyes? Can You Look Them In The Eyes? I just had lunch and watched Cesar Millan do his "magic". It struck me that his methods, like my own when I deal with my own pack, are very much based in awareness. Dogs are very interesting "subjects". They have a very strong social system (the pack). Because they are predators they have a mutual dependency not only for protection but also for successful hunts. Observing dogs and their highly subtle signals is incredibly inspiring. You can really tune in to their joy, sadness, tensions, worries and playfulness and you will notice they actually include you and communicate with you. There are a few things that are pretty different with my own dogs compared to normal house dogs. 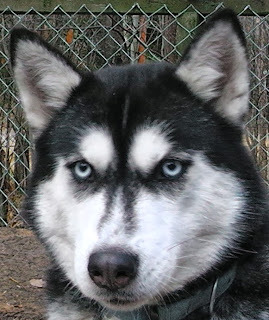 Huskies have many signals more resembling those of a wolf pack. For instance if you approach an unknown husky and he/she does not look comfortable with it. Approach the dog sideways and crouching. This is less important in normal dogs but if you watch huskies or wolves you will see that showing the flank means avoiding aggression and problems. I can recommend studying dogs (and wolves) interacting with each other. You will learn a lot from them! You will notice that dogs are optimally aware of their environment. They will sense your every thought, emotion and intent. With huskies and wolves I always have the idea that if you look them in the eyes you see your own soul reflected in them. They are hard and soft, tender, caring but also ferocious, delicate and brutal. They are full of life, they are Spirit. Sadly that spirit has faded a bit in many of our domestic dogs but it is never buried very deep and we love them for it! What is even more sad is that our culture hates wolves and by proxy we are that culture's ruthless and immoral executioners. Brutally tortured and exterminated just because a few thousand years ago some thought it would be a great idea to till the earth instead of sharing it. Before, millions of years had passed without conflict. All the while they never hated us back and they never will. They just love life. Can you look a wolf (or a dog) in the eyes and not feel very very sorry and very very guilty? Ishmael, Take It Or Leave It!